Into the Fire constitutes a deeply humanistic portrait of the Spanish Civil War that compliments the more traditional, and uncritically masculinist, narratives that have generally shaped how the war is understood. In high school, and like many aspiring leftist intellectuals, I went through a Spanish Civil War phase. George Orwell was my first guide, followed later by Murray Bookchin. At the time, I was not conscious of the gendered nature of the narratives I was reading. The marginalization and virtual absence of women did not register. I simply took for granted that, particularly in war, men were the ones who made history. 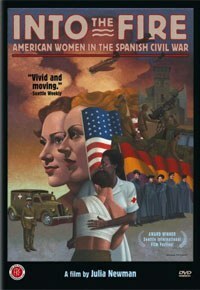 Were I an idealistic teenager today, I'd like to think that I would have found my way to Julia Newman's rich and compelling documentary Into the Fire, which recounts American women's participation in the Spanish Civil War. I'd like to think that, as a result, my understanding of the Spanish Civil War would have been wider, more nuanced, and more in line with the liberatory politics that attracted me to '30s Spain in the first place. If only this film were available then. Into the Fire begins with a prologue introducing the war and the events that led to it. This is followed by an introduction to the American women profiled in the film and their reasons for going to Spain. The war itself is divided into three parts: Spanish loyalists, or Republicans, and their comrades in the International Brigades square off against the better supplied and militarily more powerful Francisco Franco and his fascist allies in Germany and Italy; the fighting reaches its zenith; and the war's end is brought about by a Republican retreat and their unreciprocated withdrawal of international forces. Throughout, the film gives voice to persistent criticism of the US and its position of “neutrality” in Spain. This criticism becomes more intense as the war lurches towards its tragic, from a loyalist and anti-fascist perspective at least, conclusion. The final act of Into the Fire deals briefly with the return of the women and their compatriots to America. Their story is particularly captured through driver Evelyn Hutchins and nurse Ruth Davidow, who place the Spanish Civil War within the context of World War II. They argue that it was in Spain, and not in Poland or in Neville Chamberlain's "appeasement" of Adolf Hitler, that the larger war began. Director Newman chooses to narrate Into the Fire exclusively through the words of the women volunteers. There is no third-person perspective or detached, omnipresent voice to tell the audience what it all means. There are contemporary interviews with the featured women, but mostly the film relies on recitations from articles, letters, notes and diaries written at the time. The interviews and recitations are illustrated with archival photographs and film footage, as well as original artwork by Mildred Rackley, one of the volunteers. Narrating the film in this way cultivates a sense of the diversity of the experiences among the American women who went to Spain, and resists the temptation to resolve those experiences into a single, authoritative story that could easily be sequestered and put into its so-called “proper” historical place -- on the sidelines of the “real” fight. The film's first act makes clear that all of the women who went, from writers like Martha Gelhorn to nurses like Esther Silverstein, felt some obligation to join the anti-fascist struggle, albeit for their own reasons, and they arrive via different pathways. 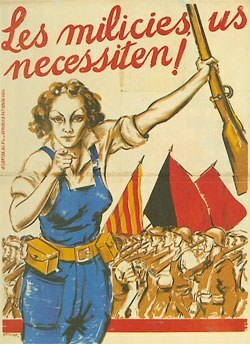 While the international struggle against fascism provides a context and grounding for the war and a means of voluntarism for the women, the film goes against the grain of many war narratives by focusing on the ways in which the Spanish Civil War affected daily life rather than emphasizing the experience of war as a series of battlefield moments. The film includes the Americans’ recollections of young Spanish girls and children going to school, the struggle to stay fed, and the difficulties of displacement from one's home. The primary theater here is in the makeshift hospitals that served the loyalist forces, and that required constant reconfiguration as battlefronts moved and territorial holdings shifted. The American women featured in the film also express their admiration and solidarity with Spanish women, from those who fought to keep their families together to those who fought with weapons alongside the men. In addition to recasting living through war as an exhausting and at times mundane experience, Into the Fire also radically reframes American geopolitical history, particularly as it relates to World War II. The dominant story of World War II roots that conflict in the appeasement of Hitler in Czechoslovakia and the actual beginning of hostilities in Germany's invasion of Poland, as indicated above. This narrative has been useful to US politicians and policymakers in that it envisions military power as the key to international relations and it ensures that the US stays on the right side of history: first by not being implicated in enabling German expansionism and then by setting America up as Europe / the world's savior. Newman's documentary, and the women she features, tells a very different story. While reaching its sharpest point in letters between Martha Gelhorn and Eleanor Roosevelt, the women volunteers in Into the Fire repeatedly criticize the official US policy of neutrality towards the conflict in Spain. This policy is seen as having not only sacrificed democratic principles to the demands of capital -- US businesses sold supplies to both the Republicans and to Franco's forces -- but also effectively aided the better equipped fascist militaries. The movie's narrative ends with Evelyn Hutchins and Ruth Davidow recounting their efforts to convince other Americans that the loyalist defeat in Spain was the beginning of a new world war. Here the US not only finds itself culpable in facilitating the start of World War II, but the lesson is not one of standing up to dictators with military force. Rather the lesson is of the necessity of supporting people in the cause of freedom, even when that means going against the interests of state. Notably for many of the women in the documentary, the fight for freedom and against fascism is not restricted to Europe or Spain. This is made most clear in the case of African-American nurse Salaria Kea, who, like other African-Americans, directly connects the struggle against fascism in Europe with the struggle for black civil rights and liberties in the US. The dominant narrative of World War II rests on a state-centered view of international relations wherein civil society stops at the boundaries between states. Outside of those boundaries one finds chaos, danger, and a host of threatening Others. The values and norms of freedom and democracy do not hold. For the American volunteers in Spain, such sharp distinctions between “inside” and “outside” did not exist. Solidarity with those seeking release from tyranny and oppression knew no bounds, and what happened “out there” is materially related to what happened “in here.” Indeed, as the rise of fascism in Europe reminded everyone, one's own state may become just as much, or more, of a threat to one's liberty than any “outside” force. At 58 minutes, Into the Fire spins its stories in a focused and efficient manner. It is also a useful length for community meetings and discussion groups and for most college courses. The new DVD version includes a short film, Archives of Activism, about the Abraham Lincoln Brigade Archives (ALBA) housed at New York University, a chronology of the Spanish Civil War, a stills gallery, a biography of director-producer Newman, a list of additional resources on the war, and trailers for other First Run Features. Archives of Activism covers ALBA's development, its in-house and online resources, recent special events, and touring exhibits. It also shows undergraduates conducting research using the archive's collection. This last feature may prove especially interesting to teachers looking to get their students working with primary historical sources. The stills gallery adds to the wealth of images already included in the film itself, but, at only 15 photos, is also very small. The chronology is a useful reference. 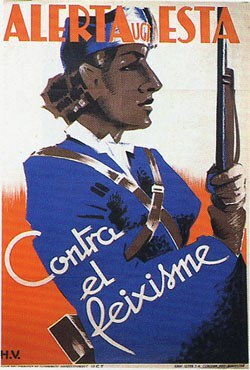 A fair criticism of Into the Fire is that it does not delve into the internal politics of the Republican forces, which included an array of left-liberals, socialists, and communists, as well as allied anarchists, unionists, and ethnonationalist movements in Catalonia, Galicia, and the Basque region. The specific sympathies of the women in the film are not made clear. But maybe that doesn't matter. The relative rightness and rivalries between different socialist, communist, and anarchist factions has received much attention from Orwell, Bookchin, et al. These are the kinds of stories that have managed to set aside the particular experiences of women in the war. They also, in their own ways, conceptualize war as a grand heroic struggle over the making of history at the expense of seeing its impact on the conduct of daily life. Into the Fire challenges both tendencies and, in so doing, constitutes a deeply humanistic portrait of the Spanish Civil War that compliments the more traditional, and uncritically masculinist, narratives that have generally shaped how the war is understood.